The Yoknapatawpha County Sheriff's Department is searching for Olympic hopefuls Cameron and Caitlin Maxwell, who were reported missing on Sunday, January 5, 2014. 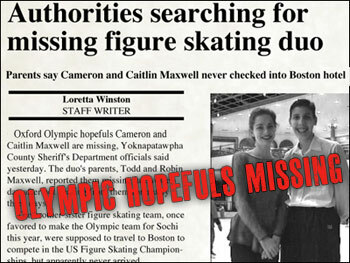 The brother-sister figure skating team was last seen waiting for a bus to take them to the Memphis airport where they were scheduled to take a flight to Boston for the US Figure Skating Championships. Cameron Maxwell, 20, is 5' 9", 170 pounds with dark brown hair and brown eyes. Caitlin Maxwell, 19, is 5' 4", 104 pounds with light brown hair and brown eyes. The YCSD is asking for your help to find these missing athletes.